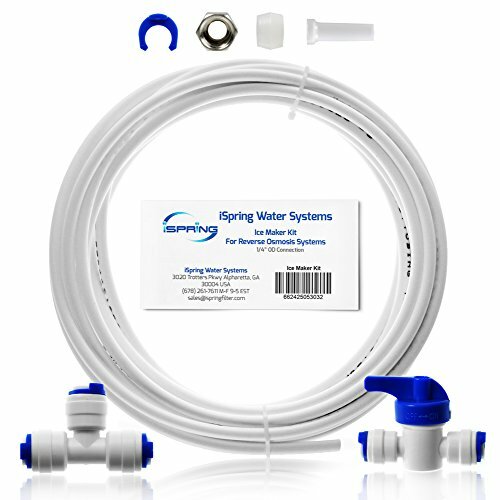 The iSpring fridge connection kit connects your reverse osmosis system or other water filters to your fridge. It can be used to supply your refrigerator's ice maker or water dispenser, your coffee maker, etc. The kit comes with a 1/4" x 1/4" x 1/4" "T" valve to branch off from the RO system, 20 feet of 1/4" tubing, a 1/4" x 1/4" ball valve to shut off the flow when needed, and a compression connection set for connecting to the output location. The fridge connection kit will work with any RO system or filtration system that uses standard 1/4" tubing. Why iSpring? Located in Alpharetta, Georgia for over a decade, iSpring Water Systems LLC is a family owned company specializing in reverse osmosis water filtration systems. Our products include residential and commercial reverse osmosis (RO) systems, whole house water systems, ultrafiltration systems, shower, faucet, and counter top filters, filter cartridges and housings, RO coolers, and kitchen faucets and fittings. Our aim is to make high quality drinking water accessible for all households. With affordable pricing, solid quality, prompt delivery, and top notch customer service, we hope to assist in bringing you great water for years to come.